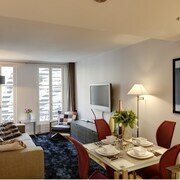 With a stay at HÃ´tel Montaigne, you'll be centrally located in Paris, convenient to Grand Palais and Eiffel Tower. 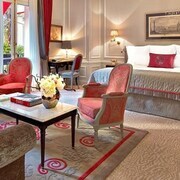 This 5-star hotel is close to Arc de Triomphe and Galeries Lafayette. Make yourself at home in one of the 27 air-conditioned rooms featuring minibars and LCD televisions. Complimentary wired and wireless Internet access keeps you connected, and satellite programming provides entertainment. Private bathrooms with separate bathtubs and showers feature rainfall showerheads and complimentary toiletries. Conveniences include phones, as well as laptop-compatible safes and desks. Take in the views from a terrace and make use of amenities such as complimentary wireless Internet access and concierge services. Additional amenities at this hotel include babysitting/childcare (surcharge), shopping on site, and a fireplace in the lobby. Guests can get around on the shuttle (surcharge), which operates within 100 km. Featured amenities include a 24-hour business center, limo/town car service, and complimentary newspapers in the lobby. For a surcharge, guests may use a roundtrip airport shuttle (available on request) and a train station pick-up service.